I'm attempting to use an Air Canada gift card to book a flight. On the back of these cards there is a section you need to scratch off (similar to a Lotto card), to reveal a 4 digit PIN number. The problem is, when I scratched mine (in the middle of booking a flight), I discovered the PIN was only 3 digits instead of 4. I simply used my fingernail to scratch it, so I know I didn't accidentally scratch too hard and remove one of the PIN numbers. "No problem" I thought, I have 3 of the numbers, so I'll just try guessing the missing number, from 0 through 9. No dice. I tried both in front of and behind the 3 numbers, even though it's apparent the missing number is at the end of the PIN (based on lining it up with another card). "Hi, I'm having trouble with an Air Canada gift card. The PIN number is supposed to be 4 digits, but mine only has 3." "I'm sorry to hear that you're having difficulties sir. I will give you a number to call. do you have a pen?" After hanging up, I Googled the number, and confirmed what I already dreaded. It was the standard booking and reservations number for Air Canada. Great. "Thank you for calling Air Canada. All of our customer service representatives are currently busy. Your expected wait time is ... 45 ... minutes. Wonderful. Apparently Air Canada doesn't accept calls from Google Talk. "Hello sir, how may I help you today?" "Hi there, I'm having trouble with using an Air Canada gift card to book a flight. The PIN number is supposed to be 4 digits, but mine only has 3." "I'm sorry to hear that sir. Let me give you a number you can call. Do you have a pen?" "I just called that number, it's the one on the back of the gift card. They told me to call you." "Sir, try calling that number and explain the situation in detail, they will be able to help." "Hi there, I'm having trouble using an Air Canada gift card to book a flight . The PIN number is supposed to be 4 digits, but mine only has 3." (sobbing) "Please, it's not the standard Air Canada bookings and reservations number is it?" "No sir, this is the number for Gift Card Customer Service"
Googling this number, it comes up as being the customer service number for Michaels.com (the Arts & Crafts chain). This does not bode well. I really need to learn to start Googling before hanging up the phone. "You have reached the customer service line for Michaels..."
"I'm sorry sir, we are only a 3rd party provider and can't do anything to help. You will need to resolve this with Air Canada directly." Update: I have heard back from the Air Canada Twitter team, at least to tell me they're looking into it. Update 12/19: It's been one week and the @AirCanada twitter team has not followed up with any response. Update 01/02: Well, it's been 3 weeks, and I've kind of given up hope that the @AirCanada Twitter team will ever follow up on this. I sent them a reminder Tweet 10 days ago, but did not receive a reply. Update 01/13: Today, someone from Air Canada contacted me, through the YYZ Deals website feedback form. They are going to look into it and try to get this resolved. They mentioned that 'this has happened before'. Update 01/23: After 6 weeks, it looks like this may have finally been resolved. Air Canada called to say the PIN has been reset. I'll be fine, and have already booked my flight with an alternative method but it makes me wonder what would happen if someone went to use a gift card, needed to book the flight right away, and encountered an issue, and had no alternative. toronto, yyz, air canada and gift cards. 9 Responses to "Air Canada Gift Cards and the Case of the Missing PIN "
Yeah! Air Canada is horrible! They really need a to change their customer service standards becuase its currently very low.I just got off the phone which was supposed to be a 56 minutes wait time turned out to be 2:30 hrs of wait time then I gave up. I fly west jet when I can because if there is any type of problem, they work hard to fix it and keep you happy. Air canada seemingly does not care about customer satisfaction. They are brutal. Really hate it when this kind of nonsense goes down. You think that after you talked to the customer service rep she would have taken charge of the problem and gone into more depth instead of throwing a random number at you and hanging up. Proof that it's a systemic problem in their customer service and not necessarily just one rep. They're probably so scared of their metrics suffering that they don't dare to go off script and go above beyond. 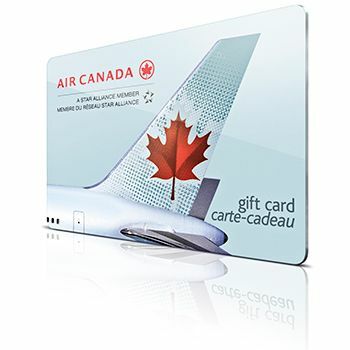 Terrible and well Air Canada gift cards are definitely not on my gift giving list. I have just spent five hours trying to book a flight with my Air Canada gift card. Apparently the PIN does not match the number on my card. I have called Air Canada customer service so many times and each time I am told to phone someone else. I finally had to book my flight without the gift card and use my credit card instead. I have written to Air Canada and asked to get my money back. Joan: If you send me a message through the contact form with your e-mail address, I can pass along the contact info of someone at Air Canada who was finally able to help me with my issue. Excellent! I'm glad at least one person at Air Canada is able to help people out! I’ve just digested a 5-course blog meal Kevan. Wowzers! Not only do I need to ask my clients these questions, I need to be looking long and hard at what my motives are in regards to how I approach my own social media strategy in my graphic ? Having problems with an Air Canada ecoupon I got from them with no pin number supplied. Cannot finish booking a flight and the reservation is timing out. Cannot get through to them! So frustrating!